I’m sure a lot of people will be asking themselves — “Why didn’t I think of that?” — after they read this. A Seattle-based company called Biking Billboards has earned a $5,000 finalist prize from the University of Washington Business Plan Competition. All month we’ve been celebrating that coolest of all forms of transportation — the bicycle. The recognition slips into high gear this Monday through Friday for National Bicycle Week, culminating in Bike to Work Day. You might be aware of bike-related promotions this week. May is National Bike Month. Get out on your bike. You’ll feel happy of yourself. Just listen to what this little fella in the video has to say about riding a bike. May 9 is Bike to School Day. May 14-18 is Bike to Work Week. May 18 is Bike to Work Day. You can search for events in your local area by checking the bike month database at League of American Bicyclists. 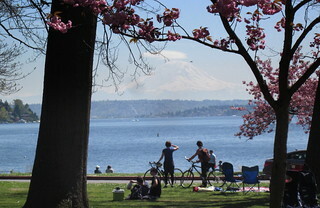 A couple of bicyclists at Seward Park pause to regard the awesome sight of Mount Rainier looming above Lake Washington. 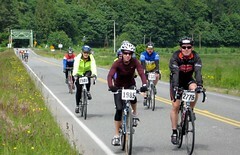 They were among the hundreds, if not thousands, of cyclists who flocked to the road along the lake on Sunday.